I like saving money. You could actually say I have a little bit of a hoarding problem when it comes to saving my cash. I have multiple savings accounts set up for various saving goals (emergency fund, vacation fund, car fund, college fund – you get the idea). I’ve found that by setting up seperate accounts for my goals it helps simplify the process of saving money. Even though I like saving money, I like spending it more and am always trying to find creative and simple ways to save money. Afterall, Your money is your greatest wealth building tool. Without money, you aren’t going to be wealthy. You can’t build up wealth unless you are willing to put money into a savings account or learn how to invest your money. My readers are in a variety of different financial situations. However, one thing that they all have in common is a desire to save their money. I personally believe that if you have a desire, then you can succeed. You just have to start with the first step. The first step to controlling your money is learning to pay yourself first. I’ve always tried to use the 10% rule of thumb. Always, Always, Always save 10% of your income. I know this may initially sound likea lot of money, but if you follow my simple money saving tips below, you can build up to saving 10% of your income. When you are first getting started, and are on a tight budget you may have to decrease this percentage. That is okay, the most important part of this rule is that you get in the habit of paying yourself first. There have been plenty of times when I was lucky to be paying myself 1% of my income. It isn’t so much the amount that you are paying yourself as the habit that you are establishing. When I was 23 years old, I got a divorce, moved home and started working for Zions Bank for $24,000. I don’t remember how much money I had when I moved home, but it was less than $500. I stayed with my parents for 5 months and then rented an apartment with a friend for $400 a month. After paying my car payment of $300, utilities, insurance, and all basics I had around $500 for food, gas, and fun each month. Although I was really tight financially, I remember that period in my life being one of the best times in my life. I had an amazing group of friends, lived near my family and lived life to the fullest. A year later then I decided to move to Phoenix, I had managed to save $2,500. To this day, I’m still not sure how I managed to save that much money on such a tight budget. I personally believe that the key was the simple consistant habit of saving money. I just kept putting money into my savings account and made a conscious decision not to touch it. It is super easy to over-complicate personal finances. The truth is, that you just have to pay yourself first. On a quick side note, I learned this principle from one of my favorite personal finance books The Richest Man in Babylon. It is a super easy read and I highly recommend this book. You aren’t going to have the discipline to pay yourself first and save your money unless you have a specific purpose for the money. Personally, I recommend your first goal be an emergency fund. Having an emergency fund makes a huge difference when you have a car accident, the washing machine dies or you have medical issues. Once you have an emergency fund, then start expanding. Aaron and I currently have 3 vehicles with over 200,000 miles, one of them is going to die, it is just a matter of time. Right now, my savings goals are centered around vehicles. I also put money towards retirement and vacations. Aaron is always wanting to save money for a new gun or bow and me for new camera equipment. If you have something fun and meaningful to save money for, you’ll have a much easier time saving money. The simplest way to save money is to automate the process. If money is deposited into a savings account every time you are paid you’ll always find yourself saving money. This is something that I’ve done for years. If the money never makes it into my regular account then I don’t miss it. I just pretend that the money isn’t there and as weird as it sounds I forget about it. Personally I think this is the simplest way of saving money. Virtually all payroll systems allow for a split paycheck. You just need to submit a request in writing with your bank account and routing number to your human resource director. 3. Have a set amount transferred automatically from your regular accounts into your savings account after each payroll. This is the same idea as the point above and is another simple way to automate the money saving process if you don’t want to go through your payroll department. The main goal is to get the money out of your regular working account as soon as possible. Have your auto transfers through your bank set up for the day after you receive your payroll check. You’ll be amazed at how quickly you can save money when it isn’t in your main checking account. This is an option that is very simple to set up. Virtually every online banking system has provisions for automatic transfers. If you can’t find it call your local bank and they can set up a savings transfer for you. Editors note: I’ve recently started to use DIGIT to save money. I seriously love DIGIT and can’t say enough good things about how simple it makes the saving process. You can read more about it here: DIGIT Review: How to Automatic Your Savings in 5 Minutes. 4. Choose something small to give up each month and put the money aside. I’ve had friends who gave up coffee, eating out, dessert or even their entertainment budget. Choose something you know you shouldn’t be doing anyway and see how much money you can save each month. I added up the little extra treats I bought myself at the mall and grocery store one month. I was surprised to find I had spent 45 on ice cream, donuts & chocolate. It is amazing how quickly the little extras can add up. If you are a sugar nut like me, you may become a bit more healthy in the process. This may also be the reason I’m struggling to lose my postpartum weight. You don’t even need to give up your item every time. Simple money saving tips like brown bagging your lunch once a week is going to save you $35-50 per month. Little amounts add up quickly. Not everyone is a position to save 10% of their income – I get it. The goal is to work towards saving a higher percentage of your income every couple of month. If you have to start with $10 a week, that is fine. Who cares about the amount, just pay yourself something. You’ve worked hard for your money, you deserve to be setting aside money for your future. 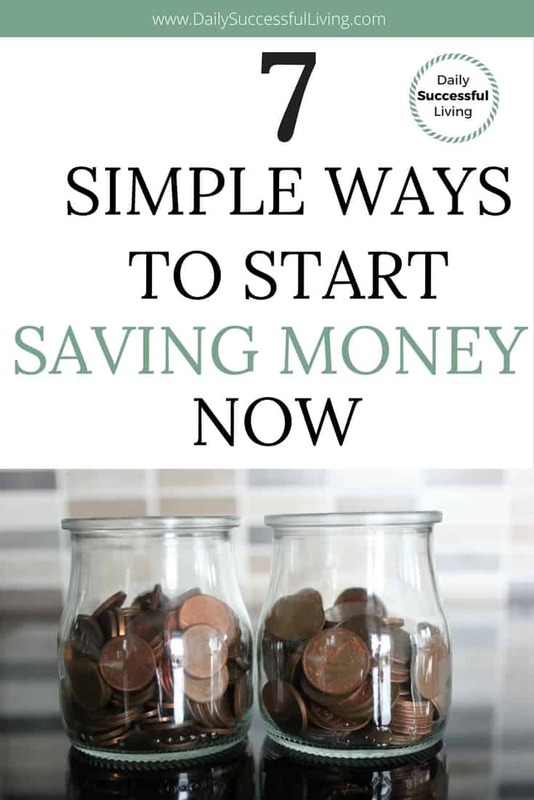 I found, when I first started, that as I saw my savings account balance increase it was easier to set aside a little bit more money towards saving each month. I know I just said that the amount isn’t important and it isn’t. What is important is that you are pushing yourself. If you can easily make your goal each week then you need to increase the amount you are saving. The trick is to choose an amount that won’t kill you financially, but at the same time stretches you slightly. I’ve always tried to set aside a little bit more than I’m comfortable with. When you start to seeing progress in your savings accounts, you’ll get even more excited and have an easier time stretching yourself to save even more. You’ll never get in the simple habit of saving money unless you set specific goals. It doesn’t work to get to the end of the month and then decide how much you are going to save. You may be the lucky one who has extra money laying around, but most of us don’t have that “problem”. You need to review your budget and set a realistic savings goal each month. I’ve found it is easiest to do my saving based on a set percentage. This way, my saving increases as my wage increase. If that doesn’t work, then set a specific amount to save and then gradually increase it every 3-4 months as you get better at budgeting. The sooner you begin paying yourself first and learn the simple ways to save money, the more successful at financial planning you will be. It is a whole lot easier to manage your money when you actually have money to manage. If you can set simple specific measurable financial goals that you are constantly working to achieve you are going to end up saving sigifnicantly more money then you ever thought possible. Just remember it is all about consistency. Start small and build from there. If you need help setting specific goals, you can download my free PDF Goal Setting Templates. Grocery Budget Makeover – This class changed my life. I thought I was great at grocery budgeting, but this class helped me save even more money. 5 Dollar Meal Plan – I’m still trying to get my meal planning right, but on the weeks I actually follow through with my meal plans I always save money (and eat more healthy). EveryDollar – Budgeting software from Dave Ramsey. I’m not currently using this system, but it is amazing – especially for newbies to budgeting.